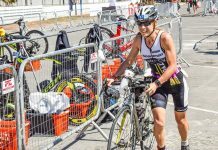 After taking a couple of years off to participate in other area triathlons, I returned to the Chicago Triathlon this year to give the Sprint distance a go. The Chicago Triathlon has so much going on that Chicago Athlete’s usual race recap article would hardly be able to cover everything that the athletes experience over the weekend, but each section of the race had something memorable about it that I think will help explain why this race is such a special event. I have worked the triathlon expo ever since I started working at Chicago Athlete and, I have to say, I really liked the layout and organization of it this year. The expo itself had everything and anything a triathlete could have wanted and the way the halls were put together, it seemed much easier to actually visit the various booths and not feel like you are pushing your way through the crowd. The way the course talks and packet pick-up were set up this year also seemed to make things go a lot more smoothly than in the past, which was a big plus in my mind. I also took advantage of the early bike set up on Saturday afternoon. I was not the only one, either, as while I was walking to transition, dozens upon dozens of bikes were seen heading in the same direction. The transition area seemed to already be 1/3 of the way filled, upon arrival, and it was only 5 p.m. This seemed to be a great and convenient addition to the race and I hope that the organizers keep it for the future. Another feature that I hope they keep is the late check-in for the Sprint athletes. Whenever I did the triathlon in the past, I always seemed to have a later wave, no matter if I was doing the Sprint distance or the Olympic distance. It was an early wake-up call and a lot of waiting around before the race started. With the new late check-in, I arrived at about 7 a.m. and was in-and-out of transition in a jiffy. Though my wave didn’t start until 9:15, I felt much more race ready (i.e. not groggy) when it was time to go. The pre-swim area had a great set-up with gear check and other tents set up in perfect spots that were easy to find and easy to get to. 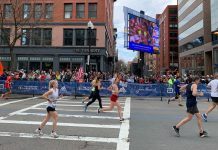 There are a lot of spectators that hang out in that area – some of which are not as observant as many of the athletes- but even with all the people down there, getting around proved to be of little problem. Before jumping into the water, there seemed to be a larger number of racers that – like me – went without a wetsuit. I have never worn one when racing, and I tend to be one of the few, but this time around, it seemed like the preferred option for many swimmers. After jumping into the 72.5 degree water, it was easy to see why so many left their wetsuits at home. The water was a very comfortable temperature (so, warmer than preferred, I think). How about those swells, though, huh? Getting bumped into and knocked around by other swimmers comes with the territory. To have the water try to fight with you as well makes things a little harder. There were many times where I felt as though I was moving side-to-side as much as I was moving forward. I am not going to lie, I love it when I can get off my bike and finally run. The run is my bread and butter of the three disciplines and, as a former cross country runner, the grass sections in the first mile of the run make me smile. 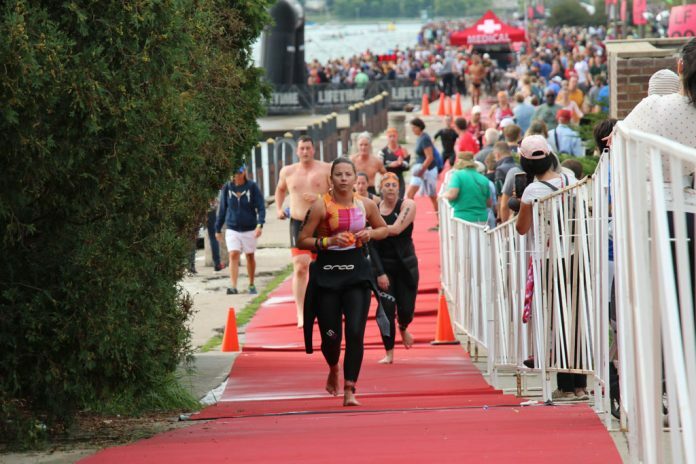 The run during the triathlon takes athletes along some paths that other races in that area don’t typically utilize, so it makes that part a little more interesting for those that spend a lot of time racing on the bike path. Though it can be crowded at times, everyone seems to always be looking out for faster or slower runners, getting out of the way at the proper time, and cheering others on as they go by. 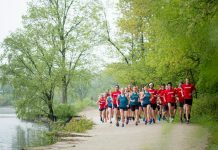 You can really feel the excitement build in the last half mile or so of the run as you get closer to the finish line and it gives you an extra jolt for your finishing kick. There is a reason why the Chicago Triathlon is one of the largest triathlons in the world. It can’t be easy to organize an event with so many different aspects to it and to do all of those aspects well. The organizers have shown that it is the athletes that come first and making it a day to remember is at the forefront.